How do you feel about take-out? When someone says “take-out” to me, my mouth waters. Take-out for me is typically Chinese food but in my head, it’s anything satisfying, flavorful, and non-American. When I was in London a few weeks ago, I had dinner at an Indian restaurant and we ordered a bunch of dishes for the table. Every single dish was so insanely good, I was in heaven. 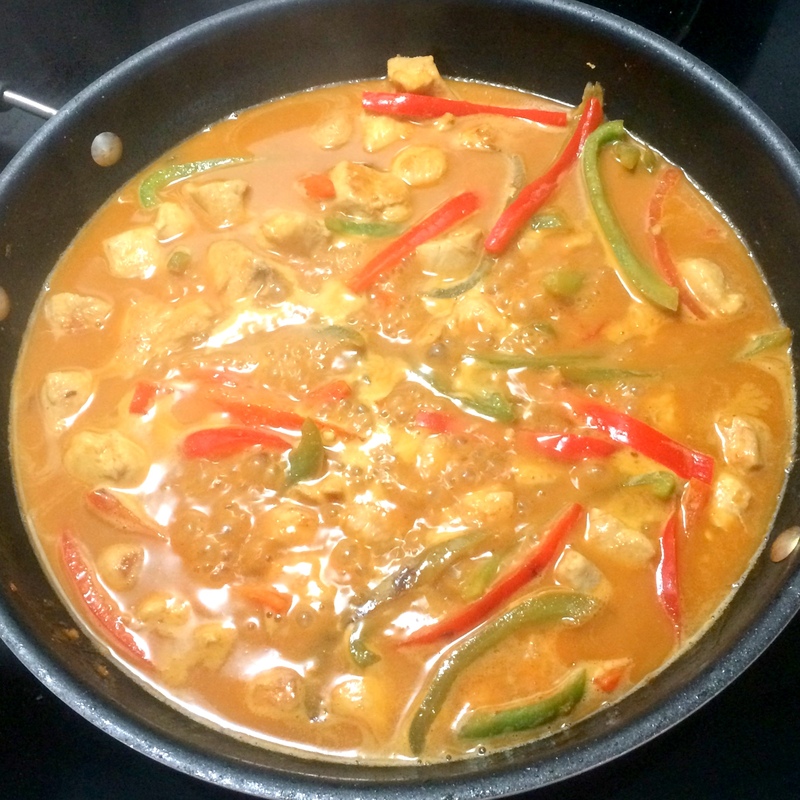 Since I wasn’t aware of any really good Indian restaurants nearby, I decided to make this Chicken Curry at home. 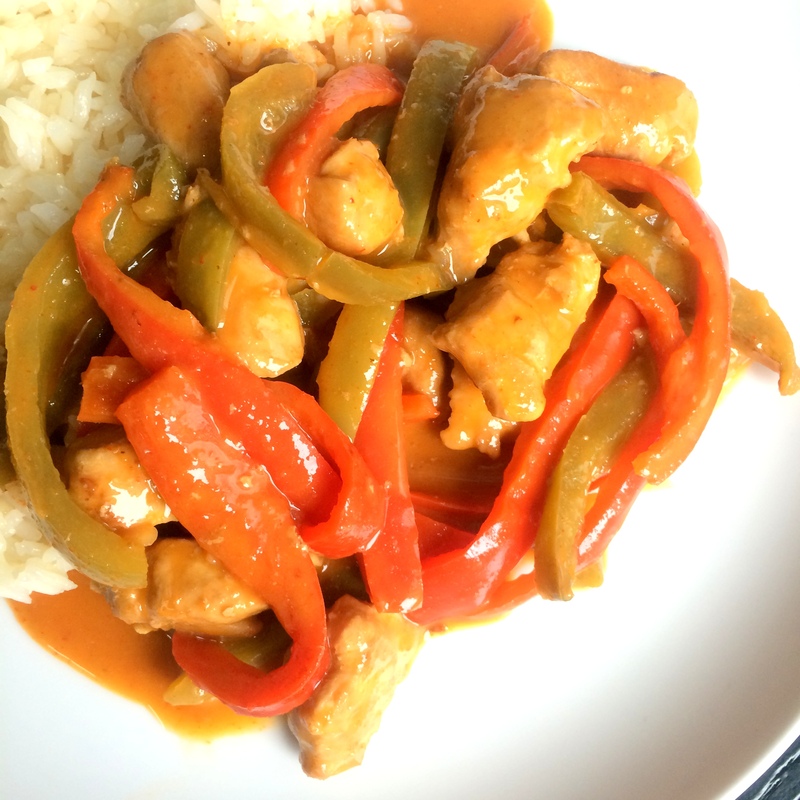 Chicken and bell peppers are sautéed before being mixed with a mixture of coconut milk, red curry paste, lime juice and soy sauce which is cooked until thick and bubbly. 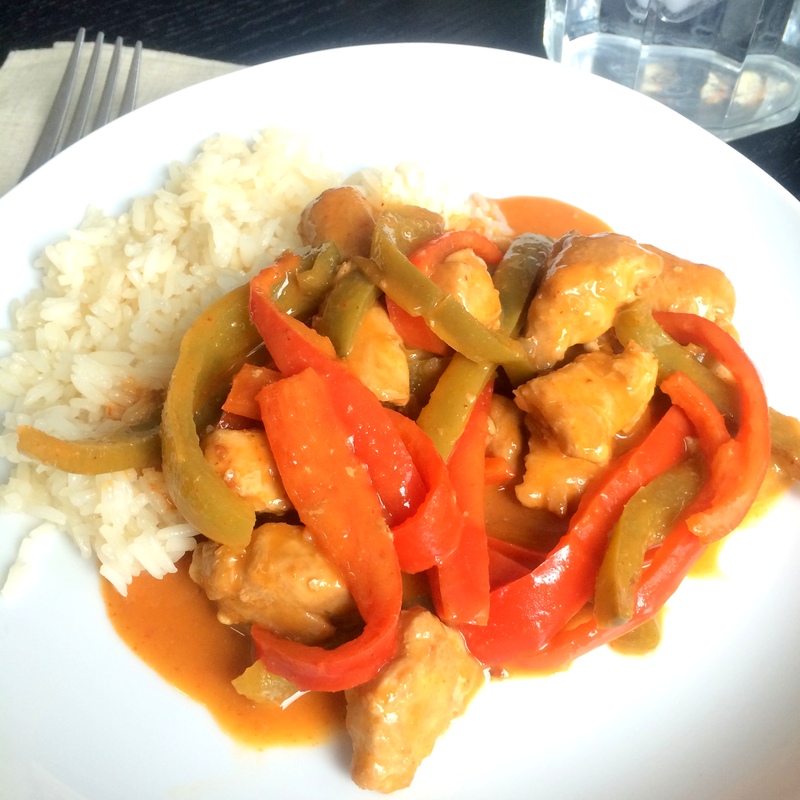 The result is a lively yet mellow chicken curry that really hit the spot. Red curry paste has a mellower flavor (in my opinion) than curry powder and isn’t as overwhelming on the senses. The coconut milk is creamy and subtle and makes for a perfect base for this sauce. This dish is an ideal example of something I would want for take-out. Luckily, a new Indian restaurant opened up right next door to my Chinese go-to. I stopped to look at the menu last time I was there and I’m pretty sure I know where my next take-out order is coming from. Heat a large nonstick skillet over medium-high heat. Add oil to pan; swirl to coat. Sprinkle chicken evenly with salt. Add chicken to pan; cook 6 minutes or until browned, turning once. 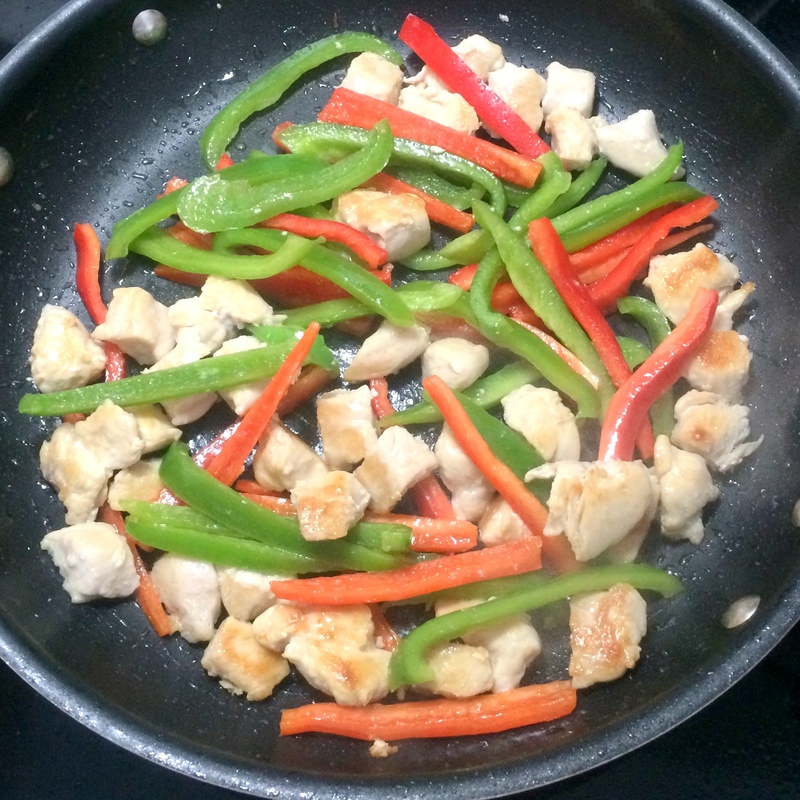 Add bell pepper to pan; sauté 4 minutes, stirring occasionally. 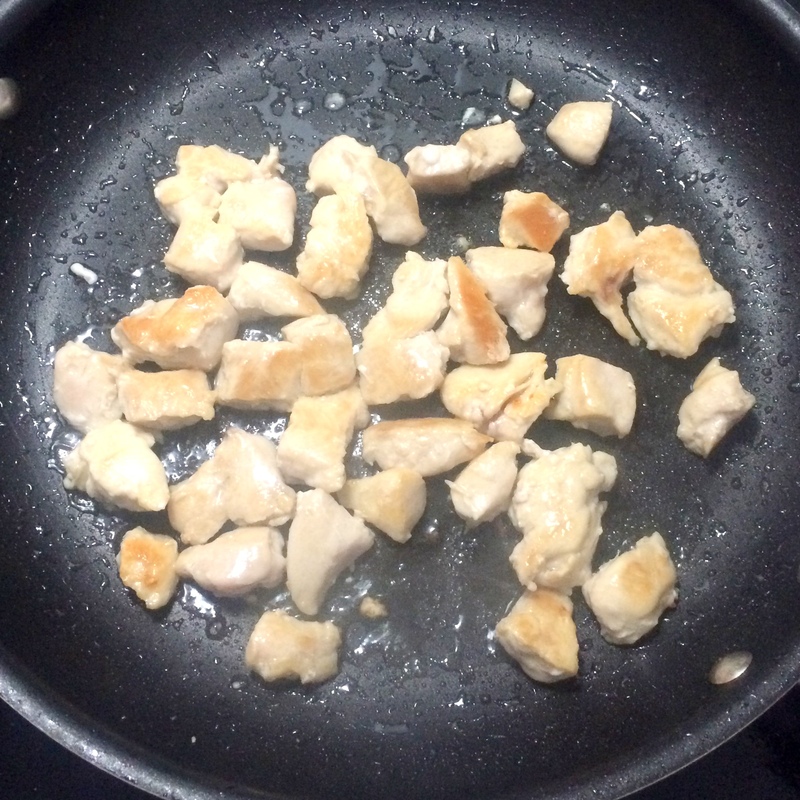 Remove chicken mixture from pan. Combine juice, soy sauce, curry paste, and sugar in a small bowl, stirring with a whisk. Add juice mixture and coconut milk to pan; bring to a boil. Cook 12 minutes or until slightly thick. Return chicken mixture to pan; cook 2 minutes or until thoroughly heated.